1. Jack in the Box nursery is a private provision providing, flexible sessional and all day care for children aged 3 months to 9 years. Sessions begin at 7.30 am and finish at 6.00pm. Breakfast, hot lunch and tea can be provided. The nursery is open all year except for one week at Christmas. We believe that all have (children, staff and their families) the right to achieve their full potential. We aim to achieve this through early intervention, training, working partnerships with parent/carers, health professionals and local professionals. 2. We operate within a purpose built building, set in an acre of rural land close to a small village, Hempnall. The building is on one level with low level toilets for the children and two changing areas. There is also disabled toilet. We also have arrangements in relation to handling and disposing wet and soiled nappies/clothing. With an enclosed garden we are able to offer free play inside and out. Hempnall offers local facilities such as a health centre, doctor’s surgery, post office and shops. We are able to offer breakfast club and after school club with the ability to take and collect children from local schools such as Tasburgh and Hempnall. Parents can also use the nursery during school holidays. Seek advice from external agencies. When the need is clear, we implement strategies to support the child and the family, for example manage risks, use preferred communication systems, and invite professionals and parents into the nursery. Our setting maintains the ratio of adults to children that is set through the Safeguarding and Welfare Requirements. We also have extra volunteers through our local college. All staff are DBS checked and so are able to work with the children. Each child is allocated a special person. On the initial registration document there is an allocated question with regard to your child’s dietary requirements. If however during your time at nursery such requirements change, please tell us and we can accommodate any change in needs without any problems. 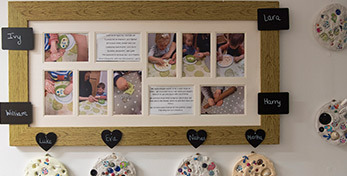 Involving professionals such as the ‘School to school’ project who send professionals to visit the nursery and offer support and strategies tailored to each child. An integrated transition scheme in which the child attends school alongside a special school to share good practice and resources. 4. We ask parent/carers to visit the nursery and meet our staff. Appointments can be made by e mail: jitbnurseryoffice@gmail.com or by telephoning 01508 499611. Application forms can be accessed via our website, click here. When an application form is received we will arrange a home visit to discuss how we can support each child and how we can support them in the nursery. Work as a team on our approach to communication, managing behaviour and routines. Seek specific training to support individual needs. 8. The nursery offers a weekly e mail communication to all parent/carers. We also offer a tailored diary so that parents can see what the child has experienced during the day. Regular Parent/carer chats are offered, alongside developmental reviews. We are members of The Professional Association for Childcare and Early years. We are fully insured. 10. Our staff are highly qualified as early year’s practitioners. Our managers and SENCO works closely with the health visitors, Long Stratton HUB, children centre family support workers and speech therapists. These professionals often visit the nursery to support children. We also act as lead professionals in Family Support meetings and offer extra transitional support for children when they arrive and move to another setting or school. All our staff are trained in Sign-a-long communication systems. We also use Pictorial communication and routine strategies. Staff have experience in working with children complex medical needs, diabetes, autism and global learning delay. Staff are all first aid trained and seeks specific training for individual care plans and medical requirements. 12. We welcome suggestions on our service and will give prompt and serious attention to any concerns about our setting. We hope most concerns will be resolved quickly by speaking to our staff or managers. If this does not achieve the desired result, we have procedure for dealing with concerns. 13. 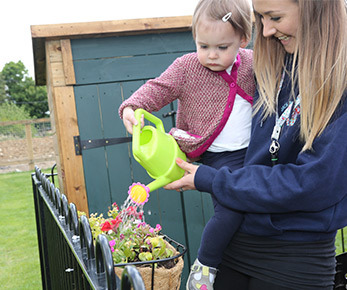 Our nursery is registered to receive two year old and three/four year old funding. 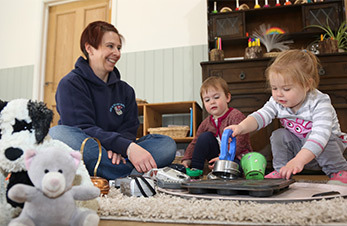 Early Years Funding is available for children from the term after they turn two and three years old. Full details will be given to you once your child is eligible and you will be asked to complete a declaration form from Norfolk County Council. This funding entitles your child to attend up to 15 hours per week for up to 38 weeks per year to a maximum of 570 hours. (Subject to Local Authority changes). As parents/carers you will be able to choose how to use your 15 hours within our hours of operation. You will have to decide this for each term, and changing it mid-term may not be possible. If the hours your child attends per week exceeds the 15 hours we can claim from Early Years Funding, you will be charged an hourly rate for the extra. It will not be possible to change this pattern of attendance with EYF mid way through a term. If your child is not yet eligible for EYF funding, you will be charged the hourly rate which is £4.60. In either case hours can be increased at any time subject to availability, and these will be charged at the hourly rate. Join the conversation online! Follow Jack In The Box Nursery.